Enrico's Ghost features an attractive barred pattern that appeals to a wide range of gamefish. Inshore fish like striped bass, bluefish, and redfish, and offshore species like tuna, dorado, and jacks all go for flies with this type of coloration. Also a fine choice for northern pike, peacock bass and other bruiser freshwater fish. An excellent fly to have in the box when you're not sure exactly what you're going to run into! Enrico's Ghost flies are tied on super sharp Gamakatsu hooks. 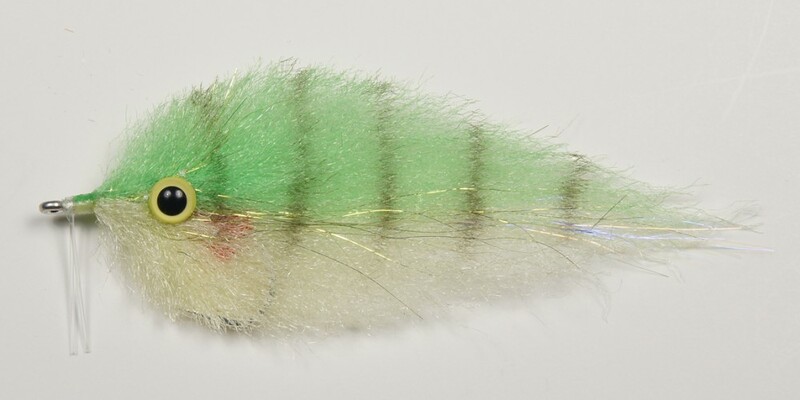 These #2/0 flies are approximately 3 1/2 (9 cm) long; this fly features a monofilament weedguard. Tied by Enrico Puglisi Ltd.